Judges whether the parking brake is released using the vehicle speed signal and the parking brake switch signal, and sounds the buzzer if necessary. 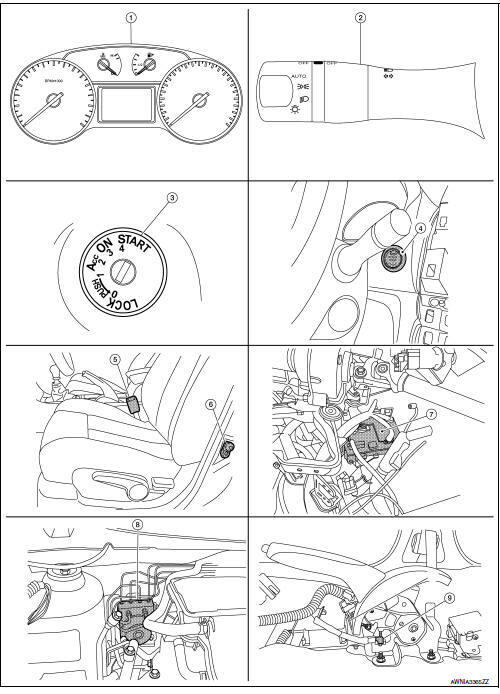 Receives the seat belt buckle switch signal from the seat belt buckle switch and transmits it to bcm with can communication line. Receives a buzzer output signal from bcm with can communication line. Lighting switch Transmits lighting switch status signal to the bcm. BCM Transmits signals provided by various units to the combination meter with can communication line. Front door switch lh Transmits door switch signal to bcm. Key switch Transmits key switch signal to bcm. Seat belt buckle switch LH Transmits seat belt buckle switch lh signal to the combination meter. Parking brake switch Transmits parking brake switch signal to the combination meter. Abs actuator and electric unit (control unit) Transmits the vehicle speed signal to combination meter with can communication line.